London (AP) – In a landmark decision that some ethicists warned is a step down the path toward “designer babies,” Britain gave scientists approval to conduct gene-editing experiments on human embryos. The researchers won’t be creating babies – the modified embryos will be destroyed after seven days. Instead, they said, the goal is to better understand human development so as to improve fertility treatments and prevent miscarriages. The decision by Britain’s Human Fertilisation and Embryology Authority marks the first time a county’s national regulator has approved the technique. Permission isn’t explicitly required in many other countries, including the U.S. and China. The U.S. does not allow the use of federal funds for embryo modification, but there is no outright ban on gene editing. Gene editing involves deleting, repairing or replacing bits of DNA inside living cells in a biological cut-and-paste technique that scientists say could one day lead to treatments for conditions like HIV or inherited disorders such as muscular dystrophy and sickle cell disease. 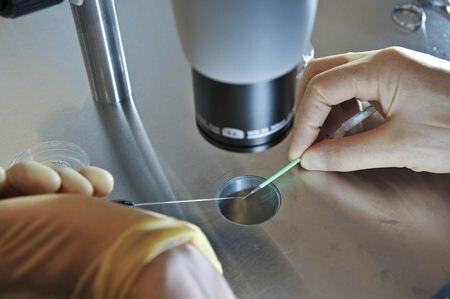 A team led by Kathy Niakan, an embryo and stem cell specialist at London’s new Francis Crick Institute, received the OK to use gene editing to analyze the first week of an embryo’s growth. The research will “enhance our understanding of IVF (in vitro fertilization) success rates by looking at the very earliest stage of human development,” said Paul Nurse, director of the institute. None of the embryos will be transferred into women. They will be allowed to develop from a single cell to around 250 cells, after which they will be destroyed. Peter Braude, a retired professor of obstetrics and gynecology at King’s College London, said the mechanisms being investigated by Niakan and her colleagues “are crucial in ensuring healthy, normal development and implantation” and could help doctors refine fertility treatments. Braude is not connected to Niakan’s research. There are a few methods of gene editing, but the technique Niakan’s team plans to use is known as CRISPR-Cas9, a relatively fast, cheap and simple approach that many researchers are keen to try. Some critics warn that tweaking the genetic code this way could be a slippery slope that eventually leads to designer babies, where parents not only aim to avoid inherited diseases but also seek taller, stronger, smarter or better-looking children. Many religious groups, including the Catholic Church, argue that manipulating embryos amounts to “playing God.” Some scientists have voiced concern that tinkering with genes might have unintended consequences not apparent until after the babies are born – or generations later. And some fear such practices will only widen the gap between rich and poor by enabling the wealthy to create superbabies. “This is the first step on a path that scientists have carefully mapped out towards the legalization” of genetically modified babies, David King of the advocacy group Human Genetics Alert said last month when British regulators took up the issue. “Now is the time to ensure that gene editing is not used to create GM babies and that we stay off the high-tech road to new forms of inequality and to a consumer-driven form of eugenics,” she said in a statement. Around the world, laws and guidelines vary widely about what kind of research is allowed on embryos, since such experiments could change the genes of future generations. Countries such as Japan, China, India and Ireland have unenforceable guidelines that restrict editing of the human genome. Germany and other countries in Europe limit research on human embryos by law. Last year, Chinese researchers made the first attempt at modifying genes in human embryos. Their laboratory experiment didn’t work. In any case, the embryos they used were never viable, or capable of developing properly in the womb. The CRISPR-Cas9 technique was developed partly in the U.S., and scientists there have experimented with it in animals and in human cells in the laboratory. It has not been used for any patient therapies, though Sangamo Biosciences in Richmond, California, is trying to develop an HIV treatment. At an international meeting in Washington last year, scientists agreed that attempts to alter early embryos as part of laboratory research should be allowed but that the technique was nowhere near ready for use in pregnant women. Last year, British lawmakers voted to allow scientists to create babies from the DNA of three people to prevent children from inheriting potentially fatal diseases from their mothers. In doing so, Britain became the first country to allow genetically modified embryos to be transferred into women.